This essential job needs either the teeth of sheep and cows or costly equipment. Cows and sheep leave a frightful mess, so we went for the hi-tech option. It involves: Mowing, Raking, Baling, Wrapping and Loading. The end product is BALAGE. 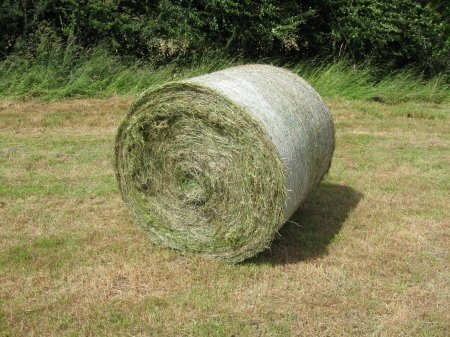 There is a lot on Google about the pros and cons of these large, plastic-wrapped Swiss-rolls of grass. 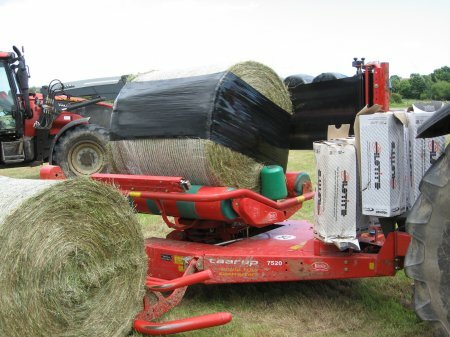 Wrapping bales with polythene film (Silotite) is an exacting operation. 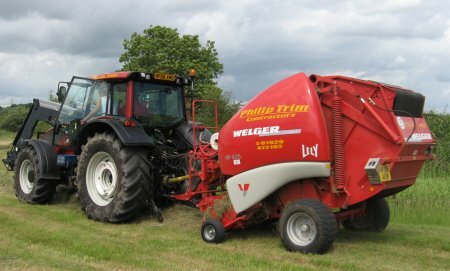 The contractor used was Philip Trim Contractors of Wareham, Dorset. 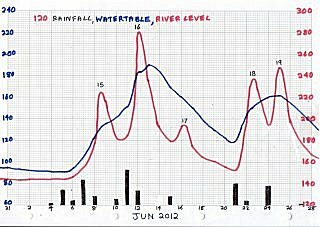 See also the Yield in 2012 in a record wet summer. 63. 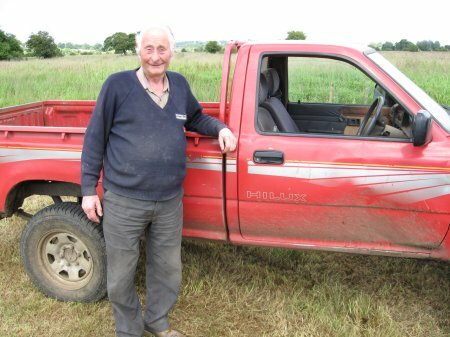 Owen, neighbouring farmer who organises all this. 63a. 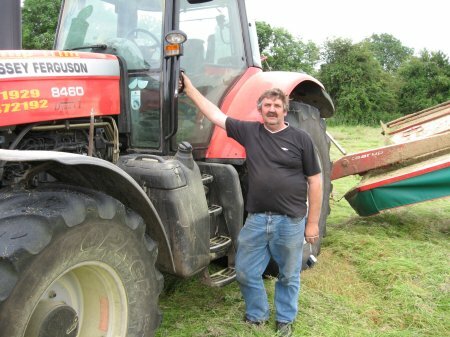 Peter has mowed grass every daylight hour for 6 weeks. He asked me "Have you been pulling weeds? ", "No, why? ", "Because there aren't any". Nice complement! 63b. With cutters ahead, port and starboard, 20 acres took 100 minutes. 63c. 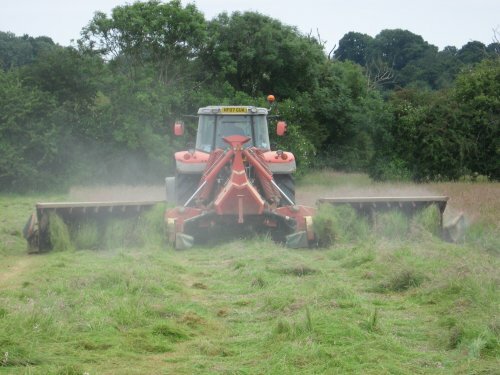 Pollen smoke rises from the grass, drivers can't have hay-fever! 63d. Squeezing into the next field, next time prune the hedge first. 63e. Finishing off field #4. 63f. 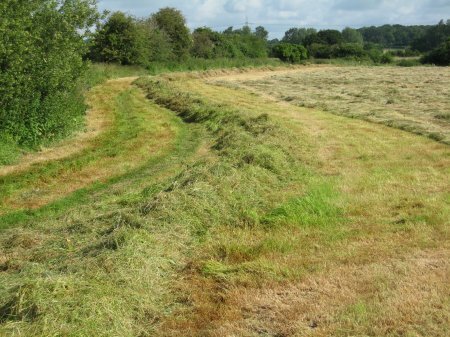 The mown grass lies and dries, ready to be raked. 63g. 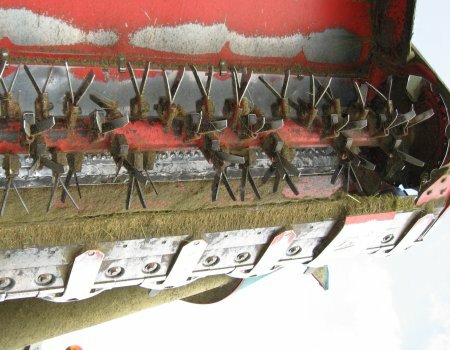 The "teeth", scissors that do the mowing. 63h. 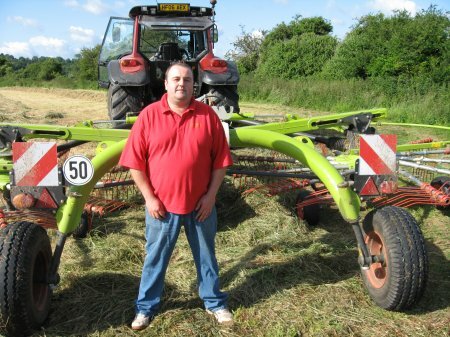 Shaun with his raker. 63i. 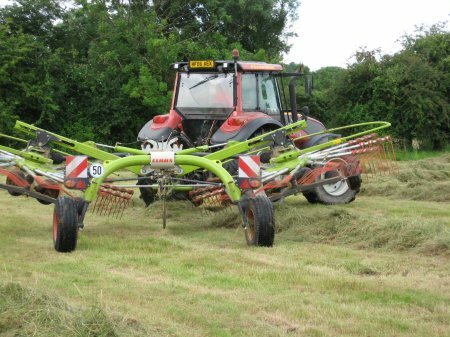 The rakes throw the grass inward, hitting a buffer, it then falls down. 63k. Raking into a line. 63j. 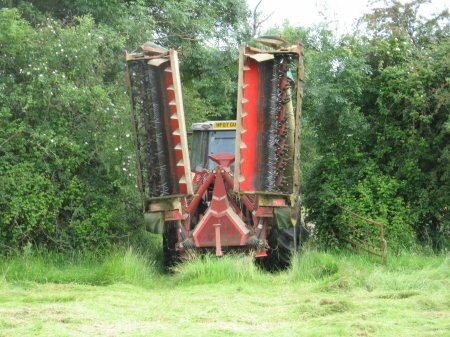 Grass raked into a line, ready for the baler. 63L. Lifting rakes for turning. 63m. 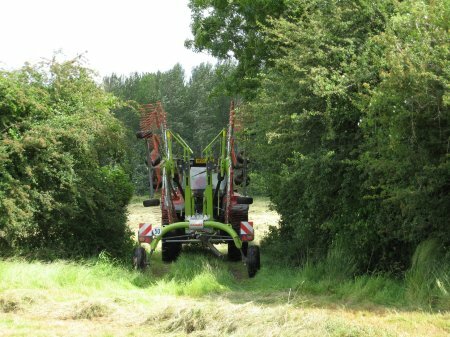 Rakes vertical to get through hedge into next field. 63n. 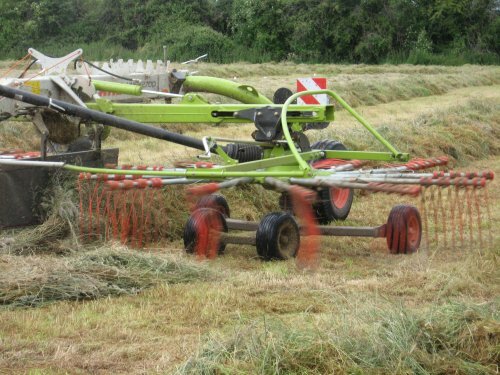 The baler makes a "Swiss Roll" and winds twine round it. 63p. A bare bale, wound with twine but without plastic film wrapping. 63q. 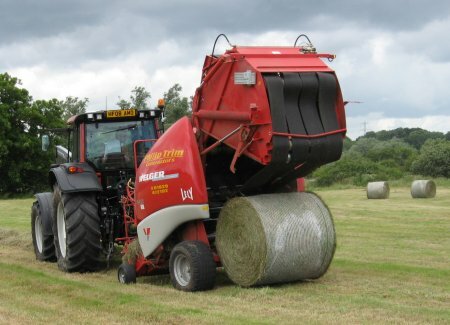 Loading a bale into the wrapper. 63r. Wrapping with Silotite plastic film (various colours available). 63s. Lifting a bale onto the transporter. 63t. Loading the transporter with bales. 63u. 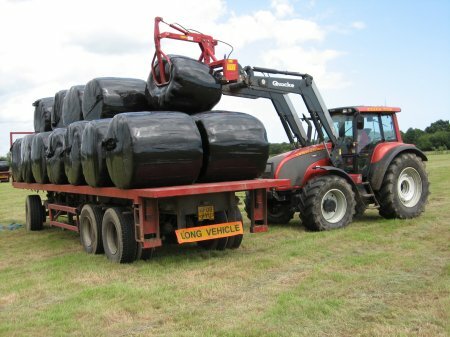 Transporting 24 bales to our customer during the 2nd cut in September. 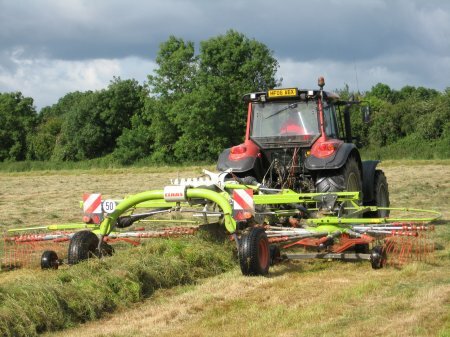 The first cut (math) in June yielded about 170 bales from 20 acres. 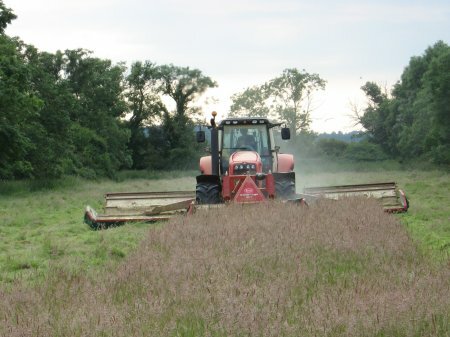 The second cut in September (aftermath) yielded about 70 bales. 2008 Jan-mid Sep has seen 778 mms of rain, unusually wet, but dry weather for 12 days before the aftermath brought in a good harvest and pleased our customer. The 4 fields look healthy and probably will need no spraying, either with fertiliser or against thistle. 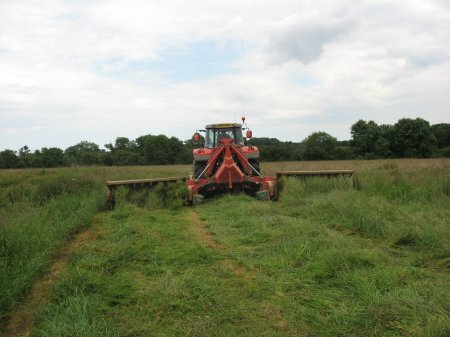 2008 has been a very good year for sweet grass, the speciality of Bear Mead. 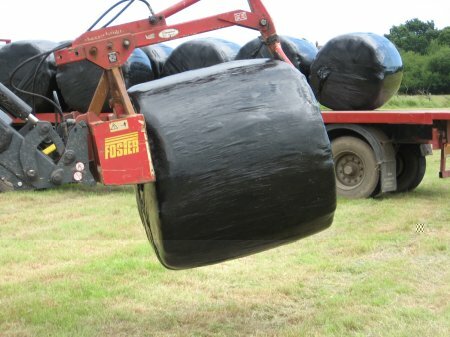 Diameter of each bale=130 cms. 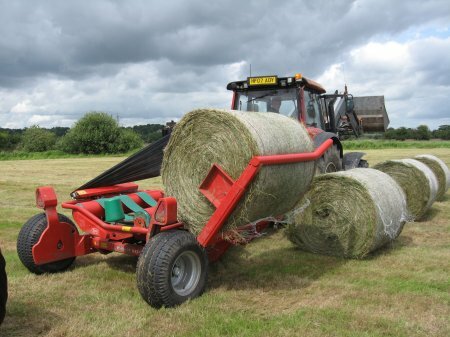 Volume of each bale  =1.658 cu metres. Weight of each bale  =406 kg=895 lbs. Total volume         =210.6 cu metres. Est total weight     =51,562 kgs=50.7 uk ton. 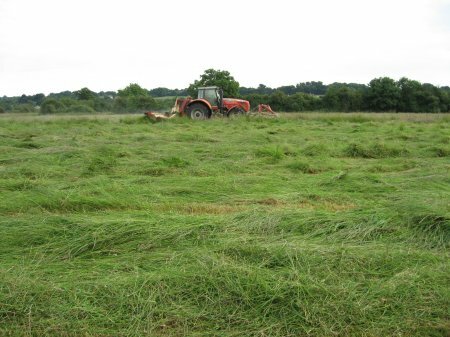 Total yield          =11.1  cu metres/acre. 112 bales x 0.75 ton = 84 tons from 19 acres. 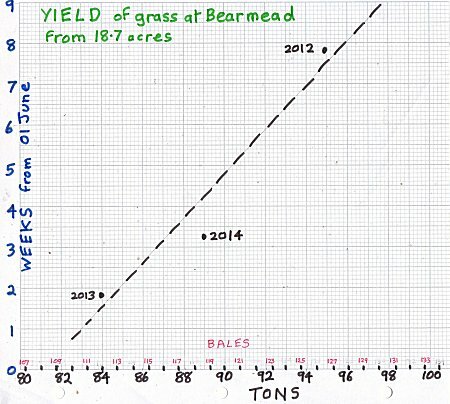 Grass yield over recent years. on 9 July flattened the grass and laid a lot of silt down. on baling may have been a mistake.